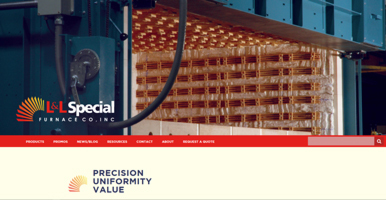 L&L Special Furnace Company, Inc., Announces Release of New Website - L&L Special Furnace Co, Inc.
L&L Special Furnace Co., Inc., is excited about our new website launch and the amount of detailed and process-oriented information it will provide for customers. We believe that this new site will allow our visitors and customers to have a very informative experience as we continue to grow and increase our market presence. L&L Special Furnace Co., Inc.’s, new website will be updated on a regular basis with news of product, applications and market activity, corporate milestones, events, and useful information. There will also be various links and interactive videos for customers to see and use. Visitors are encouraged to explore the website and sign up for direct emails from the company at https://llfurnace.com/contact/. The new website has a clean, uncluttered design, improved functionality, and enhanced rich content focused on the Company’s mission to offer the world’s finest thermal processing equipment. The new website goes live March 1, 2018, and is located at the same address: http://www.llfurnace.com/. Whether you have a specific market, process or application in mind, L&L’s website will direct you to the right furnace for your requirements. Our staff is available for questions regarding your particular thermal applications, and someone will respond directly to you.